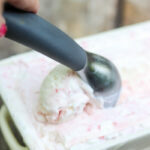 No Churn Vanilla Bean ice cream swirled with fresh watermelon puree. Doesn't require an ice cream maker. Simply mix & freeze. So delish & refreshing! In a large bowl, whisk together the sweetened condensed milk and vanilla bean paste (or extract). Set aside. Remove from freezer and drop large spoonfuls of watermelon puree around the top. Take a knife and swirl through making sure to push some down deep into the mixture.